It is described as the finest collection of American modernism ever to come to market: around 85 works acquired by the late luxury travel magnate Barney Ebsworth with the mantra “quality, quality, quality”. Christie’s says that the works, estimated at a combined $300m, will go on the auction block in New York in November after a whirlwind tour of the collection’s highlights in Paris, New York, Hong Kong, London, San Francisco and Los Angeles. Leading the list of art treasures with a sales estimate of $70m is Edward Hopper’s Chop Suey (1929), an atmospheric painting of a moody restaurant scene described by the auction house as “the most important work by the artist in private hands”. Other highlights include Jackson Pollock’s Composition With Red Strokes (1950), which Christie’s estimates at around $50m, and Willem de Kooning’s Woman as Landscape (1955), at around $60m. What the auction house didn’t mention, however, is that Ebsworth promised Chop Suey to the Seattle Art Museum in 2007. Contacted for its reaction, the museum declined to comment specifically on the Ebsworth pledge. Christie’s says that when Ebsworth died in April, he “entrusted the balance of his collection to his family” and that the auction house is selling a “portion” of the collection “in accordance with the family’s wishes”. Phone calls to Christiane Ladd, Ebsworth’s daughter in Chicago, were not returned. Stewart Landefeld, the chairman of the board of trustees at the Seattle Art Museum, referred queries to the museum’s communications department. Museums are often loath to condemn donors who renege on promised gifts unless the pledged donation involves a substantial sum that the museum relied on to meet its budget or finance a special project. Generally “a promise to make a gift is not binding” in and of itself, says Barbara Lawrence, a trusts and estates attorney at the New York law firm Herrick, although “there could be circumstances which make that promise binding, such as ‘detrimental reliance’”—if the museum relied on the promise of that gift to make a purchase, for example. Christie’s announcement of the November sale describes Hopper’s Chop Suey as one of Ebsworth’s “most prized possessions”. 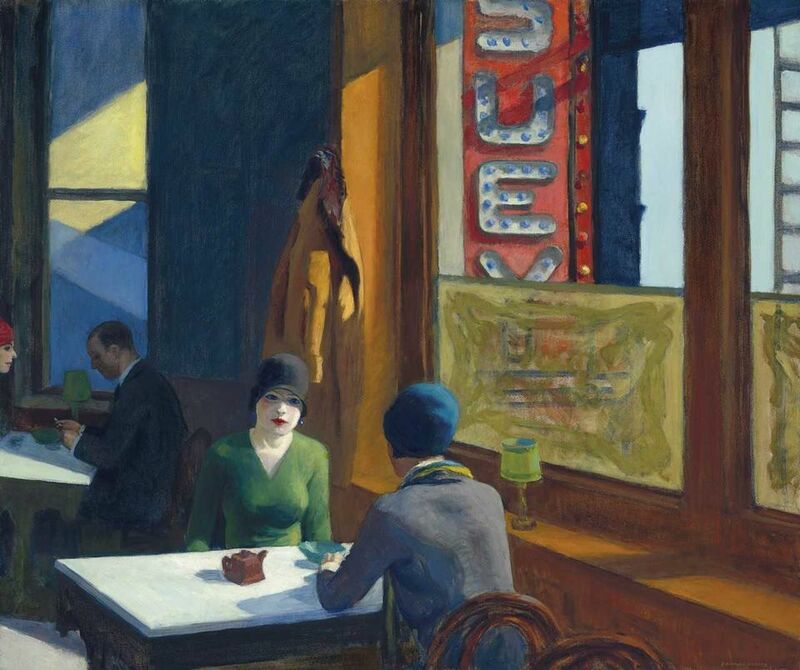 The painting, centering on two women in cloche hats sitting at a table by a window in a restaurant, “epitomises the psychologically complex meditations for which the artist is best known, while uniquely capturing the zeitgeist of New York during one of its most interesting eras of transition”, the auction house says. Among other shows, Chop Suey was previously included in a popular Hopper retrospective at the Grand Palais in Paris in 2012-13 and in an exhibition of Ebsworth’s art holdings that traveled to the National Gallery of Art in Washington and the Seattle Art Museum in 2000. Born in St Louis in 1934, Ebsworth developed a passion for art while stationed with the US Army in France, where he made weekly trips to the Louvre. After amassing a fortune in the luxury air travel and cruise ship industries, he began indulging his love of art by purchasing Old Masters but later settled on American Modernist painting as his main focus, seeking top examples by major figures. Eventually he moved from St Louis to Seattle, where he expanded his already renowned collection and became a trustee at the Seattle Art Museum. Aside from the Hopper, the Pollock and the de Kooning, highlights of Christie’s sale include Joan Mitchell’s 12 Hawks at 3 O’Clock (1960, $14m to $16m) and Jasper Johns’s Gray Rectangles (1957, $20m to $30m) as well as works by Franz Kline, Georgia O’Keeffe, Stuart Davis, Marsden Hartley, Charles Sheeler and William Glackens. The auction house says the Ebsworth works will be offered in two sales during its flagship 20th Century Week on 11 through 17 November but that it has not settled on precise dates. In its statement, the Seattle Art Museum emphasised that it had benefitted from Ebsworth’s largesse. It cited his gifts of O’Keeffe’s Music—Pink and Blue No. 1 (1918) and Marsden Hartley’s Painting No. 49 (1914-15), which are on view in a new installation of works from the museum’s American art collection, and Francisco de Zurbarán’s The Flight into Egypt (around 1638-40) and Philippe de Champaigne’s The Visitation (around 1643), which are hanging in the museum’s European galleries.